Abigail Scarlett is a professional photographer who lives in London and recently started her plan to live for six months via only bitcoin. She has some excellent work, and I do recommend visiting her site to take a look for yourself at abbybitcoin.com. Having been introduced to bitcoin in early 2014 by an housemate of hers when she lived in Brighton. He was (and probably still is) an enthusiastic bitcoiner, who was also a miner, she seems to have clearly been bitten by the bitcoin bug. She will be accepting only contracts that are paid in bitcoin for her photography work to fund her living for the next six months. Her dream, if successful, is to use the funds to launch her own photography studio and coffee shop in central London. She plans to use such a place to host bitcoin meetups and to place a commission free bitcoin ATM. And she would then embark on Phase II of her bitcoin only photography. Her repertoire encompasses pretty much everything, weddings, events, live music, pets, portraits, family, you name it, she can probably do it. And she is willing to travel anywhere in the world, as long as her expenses are covered, and the shoot piques her interest. Combined with this she uses a pay what you can afford system, assuming that basic expenses are covered. She will be creating a photo journal of her journey over the next six months, which she intends to publish at the conclusion of this particular journey. We shall be keeping an eye on her progress and will update with fresh articles as time passes. Nearly a month ago Changetip discovered Abigail and did an excellent Q & A on Abigail via the Changetip blog, which you can find here. Abigail has been known to make very interesting bitcoin items such as a bitcoin cake (who would say no to that?) 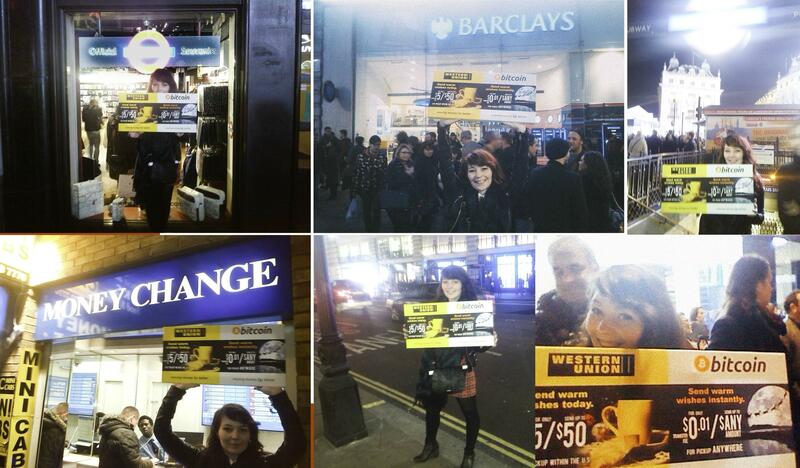 and occasionally wondered the streets of London promoting bitcoin. If you like what Abigail is doing, you can hire her via abbybitcoin.com or donate directly to her bitcoin address 1H2YfY4xCVsvmEL6wZeEt9vc8Soqq7d6Cw. You can also find Abigail through Twitter, Reddit, Facebook or Instagram.